Bristol Moms Club facilitator, Kelly Jo Sexton, is a March of Dimes Virginia Nurse of the Year finalist. Kelly Jo is a nurse at Wellmont Bristol Regional Medical Center. Lydia Landis (Southwest Care Connection for Children-Bristol VA), a strong supporter of Baby Basics Moms Club, is also a finalist. Over 470 nurses were nominated across Virginia by patients, friends, co-workers, and other health professionals from which 95 finalists were chosen in 20 categories. The awards honor excellence in nursing care and pay tribute to the men and women who work for positive changes within the healthcare community. Award recipients in each category will be announced on November 9, 2013 at a gala event in Richmond. Congratulations to everyone who was nominated, and we are especially proud of Kelly Jo and Lydia! Baby Basics Moms Club is extremely fortunate to have these talented and caring nurses on our BBMC Team!. Baby Basics Moms Club of Virginia partnered with the Wolf Hills Quilters to offer a March of Dimes 75th Anniversary Quilt for the Signature Chef’s Auction on October 29, 2013 in Abingdon. 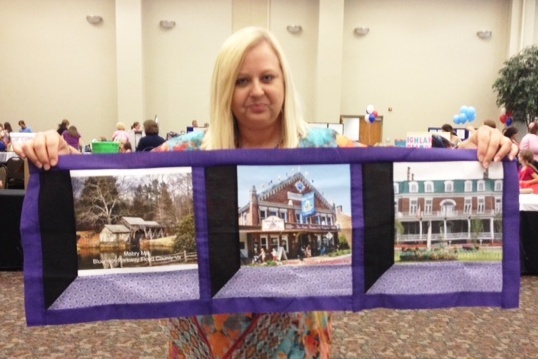 The windowpane quilt features past and present auction participants and other local and historic sites in Southwest Virginia, including The Peppermill, Martha Washington Inn, The Tavern, Food City, Burger Bar, and Baby Cakes (formerly Starving Artist). Nikki shows a sample with 3 windowpanes. 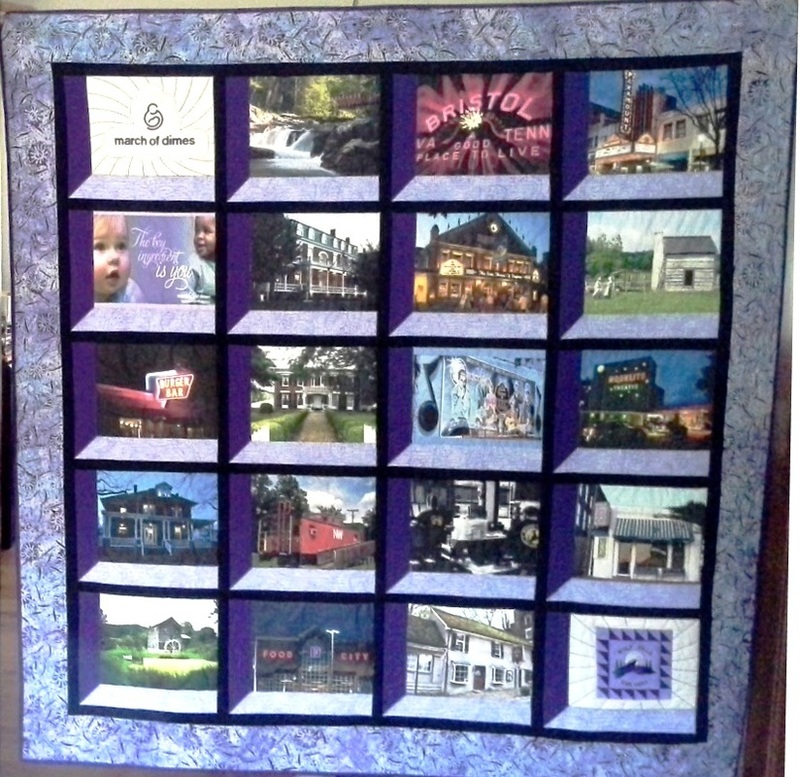 The completed quilt is beautiful! In response to the many inquiries received regarding the success of our Baby Basics Moms Club in Southwest Virginia, the March of Dimes-Virginia Chapter held a two-day informational conference for those interested in hosting, implementing, or replicating our Moms Club model. The conference was held in Lynchburg September 3-4, 2013, and was well attended. Our thanks to everyone who contributed to making our conference a success! Did you know Food City has its own Baby Club? Sign-up is free to receive special discounts and savings for Moms and babies. Click on the Food City Baby Club image to register! Emergencies Happen - Would you be ready? For the past several weeks, The What To Expect Foundation has been working on a new delivery... a revamped website that will expand their efforts and mission to educate and empower moms so they can expect healthier pregnancies, safer deliveries and healthier, happier babies. Visit their new website for more information on their goals and programs. The Baby Basics Program is a big part of that effort and we are very happy to be able to bring it to our Moms Clubs. 75 Pounds of Dimes in 75 Days! 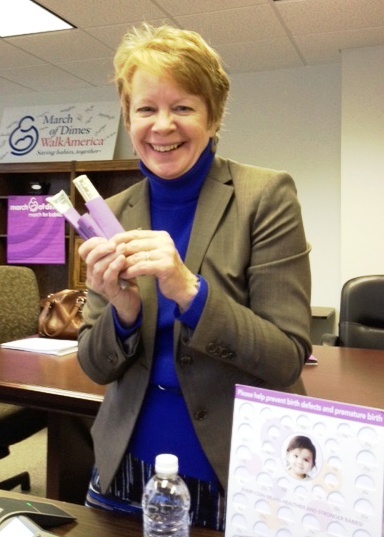 Baby Basics Moms Club gets some "heavy" fundraising assistance from Sara Long, March of Dimes State Program Director. 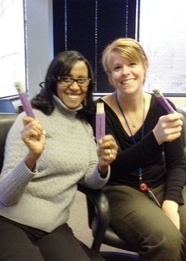 Saba and Ashley with the Program Service Committee got in on the fun, too. BBMC sends our sincerest thanks to these fantastic women! L-R: The What to Expect Foundation's Jeanne McMahon, National Program Director and Lisa Bernstein, Executive Director; Delegate Jennifer McClellan; and Merry McKenna, State Project Consultant for Baby Basics Moms Club of Virginia. Delegate McClellan of Richmond represents the 71st District in the Virginia House of Delegates. She is pictured here holding a copy of The What To Expect Foundation's Baby Basics, the centerpiece for Baby Basics Moms Clubs of Virginia. The long-standing efforts of the March of Dimes was recognized by the Virginia Assembly on January 15th. Delegate Kenneth R. Plum of Fairfax spoke about the positive impact March of Dimes has had on the health of babies over their 75-year history which began in 1938 with a campaign to help eliminate polio. March of Dimes has been instrumental in education, research, vaccines, and reducing premature births. This introduction was delivered to the Virginia Senate by Senator Ralph Northam of Norfolk. Karen Thompson (left) from Abingdon attended the recent Baby Basics Facilitator training in New York City. 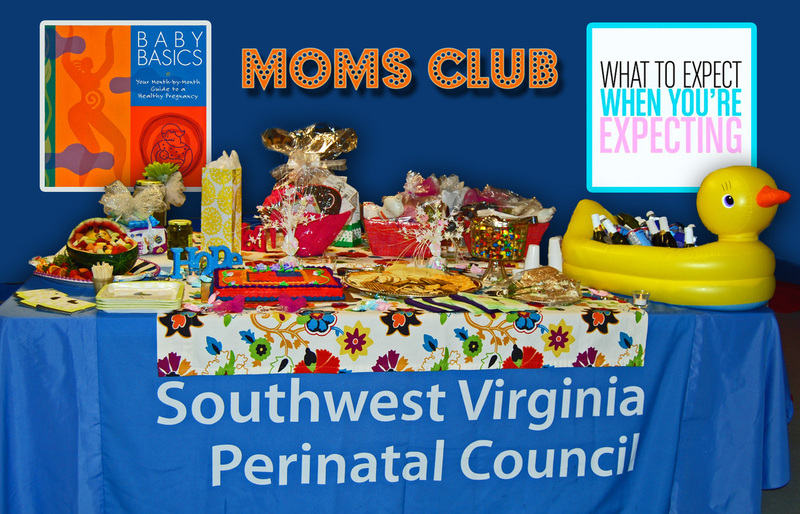 We are very excited to announce our fifth Moms Club in SW Virginia! Details are being finalized and the meeting location will be posted here and on a new Abingdon page very soon! In addition to Abingdon area expectant Moms, we hope to see participation from Smyth and Russell counties. Help us spread the word by sharing this news with your friends! The What To Expect Foundation announced the week of June 27th that it is taking their Baby Basics Program around the world to reach a global community. The announcement was first made on June 14th, 2012 by Secretary of State Hillary Clinton at the Child Survival Forum at Georgetown University in Washington, D.C. "And finally, we are launching the Women’s Health Innovation program, a partnership with the What to Expect Foundation and the Bill & Melinda Gates Foundation that will provide expecting mothers with pregnancy information, education, and social support." Read the complete transcript of Secretary Clinton's remarks here. Baby Basics Moms Club Bristol hosted a "Premiere Party" for their moms-to-be and past Moms Club participants. The party was inspired by the new movie What To Expect When You're Expecting. You can view photos here, or go to our Facebook page to download your favorites. Join us for a special Moms Club Premiere Party at Bristol's Tinsel Town Theater (Exit 7) followed by a 5:00 p.m. showing of What to Expect When You're Expecting. The first 40 pregnant women to RSVP will get free admission to the movie, PLUS ALL pregnant women that attend will be treated to a free VIP Room Party with "swag bags" for our moms-to-be!